The Atlantic Spotted Dolphin - they’ve been evolving for about 10 million years now. And while their ancient ancestors lived on land, rising ocean waters led these animals to become mammals of the sea. Dolphins are mammals, and all mammals breathe air. Dolphins breathe through a blowhole. Atlantic Spotted dolphins also blow bubbles through their blowholes as one way to communicate with other dolphins. They also communicate with sound. These sounds are generated from air sacs below the blowhole. The dolphin has an amazing setup for hearing. Like all mammals, it has ears, including middle and inner ear canals. But it uses other body parts for hearing assistance. That giant forehead on the dolphin is called a melon. And it acts like an acoustic lens, aiding in sound recognition. In addition to the melon, the dolphin’s teeth are arranged in a way that they function like antenna, receiving incoming sound. The dolphin’s jawbone also has sound receptors that conduct sound vibrations to the middle ear. Dolphins have great eyesight above and below the water, but it only works for about 150 feet. So dolphins use echolocation to fill in what they can’t see visually. The dolphin can interpret echolocation signals received from a half a mile away. 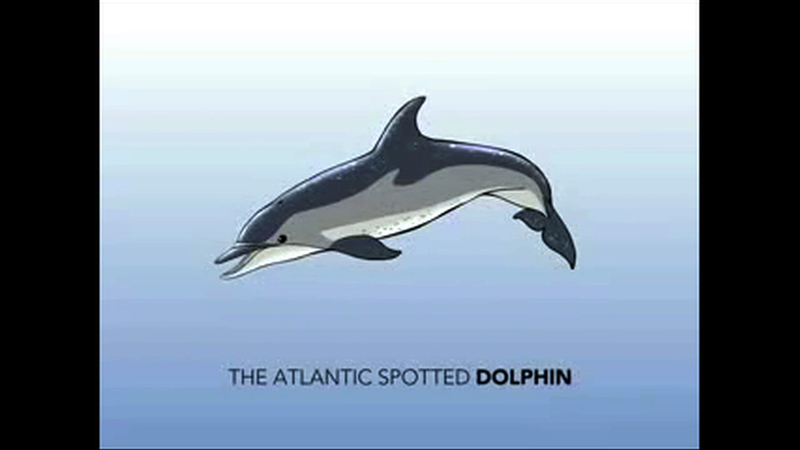 The spots all over the Atlantic Spotted dolphin start appearing after its first birthday. As the dolphin matures, the spots get darker. Instead of arms and legs, dolphins have fins. The dorsal fin helps the dolphin maintain stability. The pectoral fin is used for steering and movement. Each tail fin is called a fluke. It’s used for movement and communications. Veins in the fins and flukes help conserve body heat it cold water. How do you know if a dolphin is male or female? Look for the slits near the tail. If there are two slits, it’s a male. If there are three slits, it is a female. Females give birth and nurse their young like all mammals. The gestation period for Atlantic Spotted dolphins is 11 months. And dolphins are smart. They have the second largest brain of all mammals: The first being us humans. All these parts working together make the Atlantic Spotted dolphin one magnificent marine mammal.